As male turkeys become sexually mature at about 6 months of age, they begin developing long talons, one on the back of each leg. Known as spurs, these talons grow throughout the turkeys' lives. Only male turkeys grow the spurs, which -- along with their long chest tassels and erect tail feathers -- show females they are a desirable mate. You can tell a turkey's age from his spur length. 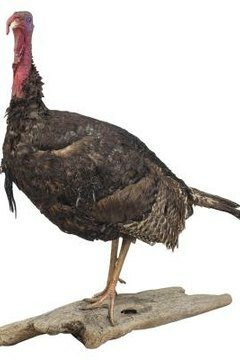 If your turkey's spurs look like blunt nubs less than a half-inch long, your turkey is less than a year old. The spurs will grow to an inch in length by the time he is 2 years old, remaining straight and blunt. After the tom's age 2, the spurs will begin to curve as they grow, and become more pointed. A tom with sharp, curved spurs more than 1 1/4 inches long is more than 3 years old. Wild turkeys in Texas have been known to grow spurs up to 2 inches long. Outdoor Life: Strut Zone -- What are the Longest Turkey Spurs Ever Registered?